Runners and cyclists can tolerate heat and cold but the thing they dislike most is wind. They know it produces slower lap times on loop courses. Can we show them why? In practice, the quantity depends on the aerodynamic quality of what you are wearing and your degree of streamlining as well as your geometrical area. We split it up as two parts , where is the geometrical cross-section and is a drag factor, which takes shape and clothing texture into account, and typically is . A top class sprinter with a mass of , moving through air of density , with body area and drag factor will use about 3% of their energy overcoming still air resistance. If there is a crosswind then you feel the vector resultant of the oncoming wind that you are running through at speed and the perpendicular crosswind . The magnitude of the resultant velocity is therefore (at an angle to your direction of motion, where .) 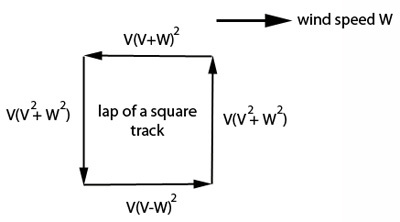 The magnitude of the drag force experienced is proportional to its square The power needed to run at speed through a crosswind is therefore proportional to the product of the running speed and the drag force, that is We will assume that the area you present to the wind coming in at angle is the same as it is in your direction of motion, although it might well be slightly bigger. The asymmetry noted above enables us to understand why it is always harder running laps in the wind than in windless conditions: you never gain from the tailwind what you lose into the headwind. You see that the smallest running power of is required when there is no wind ( ): the power is always bigger with any non-zero wind speed. The best racing strategy for runners in races that cover many laps is also clear. When you are running into the wind you should try to shelter behind other runners to avoid feeling the full force of the wind. Most runners appreciate this slip-streaming trick but they often don’t recognise the other part of the optimal strategy. When the wind is behind you, move out to make sure there is no one directly behind you shielding you from feeling the full benefit of the tailwind. This won’t make running in the wind easier for you than when the air is still but it will make it easier than it is for your rivals. The most energy-sapping type of wind is not a head-wind, but a side-wind (i.e. one that blows from the side). 45 degrees, furthermore on an out and back course it has a retarding effect in both directions.